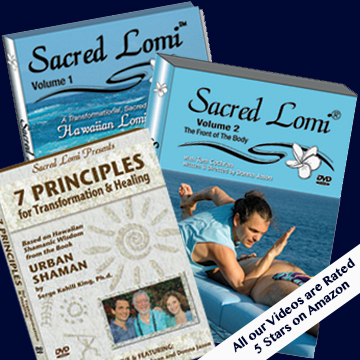 Learn lomi lomi at home with Sacred Lomi’s Home Study Course and DVDs. If you already own the DVDs, choose the Ala Carte option in the drop down menu below. Lomi Lomi Home Study Course • Earn 6-12 CE’s with NCBTMB and most states • Written booklet, practice log, client feedback forms and test. Price range based on whether or not you already own the DVDs. Sacred Lomi Volume 1 DVD covers all of the detailed runs on the back of the body as well as principles, history and philosophy of this beautiful art. The course comes as a downloadable booklet that further details how to become a successful lomi lomi practitioner. The course syllabus is simple, straight forward and can be completed in 6 hours to earn you 6 NCBTMB CE’s. Your continuing education credits also count for Florida, Texas and most other States. Sacred Lomi Volume 2 DVD covers all of the detailed runs on the front of the body as well as more principles, history and philosophy of this beautiful art. The course comes as a downloadable booklet that further details how to become a successful lomi lomi practitioner. Each course syllabus is simple, straight forward and can be completed in 6 hours to earn you 6 NCBTMB CE’s. Your continuing education credits also count for Florida, Texas and most other States as well as CMTO in Ontario, Canada. “I love your DVDs! I’ve already been practicing and my clients love it too.” Dianna M.
A Certificate of Achievement will be emailed to you upon successful completion of the course test, practice log and client feedback forms. DVDs will be mailed to you. The Written Course can be downloaded or emailed to you.